Though it is a question might seem heretical to some, what is the point of céilí band albums? After all, céilí bands provide music for dancing and, in listening terms, they really are the thrash metal of traditional music. They’re about as subtle as a flying mallet and their albums seem to test endurance to the limit. That being said, the Kilfenora is clearly one of the best of the bunch and this album captures the band in its natural environment, a dance at The Royal Spa in Lisdoonvarna, playing for a host of enthusiastic dancers. The band includes some talented musicians in their own right (Garry Shannon on flute and accordionist Conor McCarthy) and they do try and mix the jigs and reels with some alternatives, such as the Kilrush Polkas and a set of waltzes called The Atlantic. Both the music and the arrangements are tight and they contrive to avoid that dreadful céilí band ‘plod’ which is often inflicted upon slower tunes. In other words, the Kilfenora knows how to set a pace which makes this an album ideal for dance practice. As for repeated listening? Never. 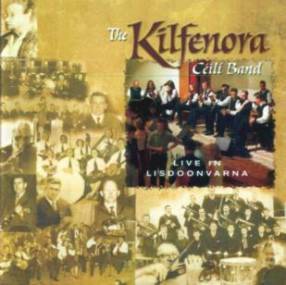 For more information about the Kilfenora CB visit www.kilfenoraceiliband.com. Dolphin Records’ website is www.irelandcd.com.